Currently, China throws away roughly 120 million waste appliances per year, including computers, televisions/monitors, washing machines, refrigerators, and air-conditioners. Yet, for the better part of two decades, most environmental activists concerned with China have taken a far greater interest in how foreigners dispose of their wastes in China (for example, attention devoted to the e-scrap exported to China by the developed world), than in how the Chinese will dispose of the products of their rapid economic development. I’ve long argued, on this blog and elsewhere, that the emphasis is misplaced. Today, and long-term, the far more serious threat to China’s environment comes from China. So the question arises: What is China doing about it? Believe it or not, there are some very smart and well-intentioned people who are not only devising solutions, but beginning to implement them. Some are simple, like the vibrating water tables that I mentioned a few weeks ago. Others are more complicated, as outlined in my feature-length treatment on the subject, “An Evolving Approach to Electronics” in the May/June issue of Scrap Magazine (I know – I’m late in posting this). 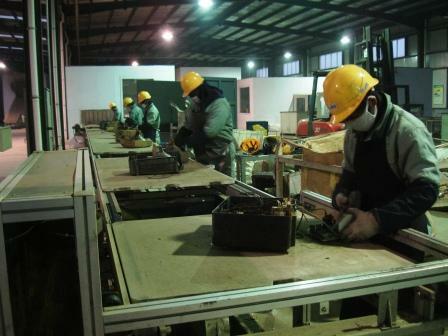 The story focuses on three e-scrap facilities, two in Linyi (Shandong), and one in Qingyuan (Guangdong) that have begun to apply low-tech, profitable, and environmentally sound approaches to the recycling of e-scrap in China – all with the support and investment of local and national government. The systems are far from perfect – some of their byproducts still are sold into the old system – but they’re better than what was available even two years ago. 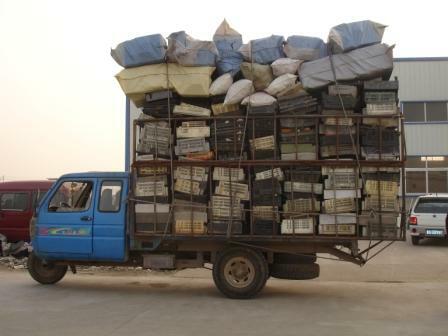 This summer, hopefully, China will finally issue its long awaited rule on the recycling of appliances. If and when it does, these companies will be at the forefront of China’s e-scrap recycling evolution. After the jump, an excerpt with some photos. The full text won’t be available online for a few months. But, when it is, I’ll post a link. Ahead of us is a pile of plastic television casings. A truck carrying another tall load of casings rumbles past the gate and speeds into the facility. I pause to watch it disappear, then I stop to examine the pile of televisions in front of me. On the ground– which is entirely hard-surfaced–are a few pieces of broken CRT glass and some fragmented circuit boards. Chinese and international law strictly prohibit the importation of these materials due to their high lead content and other potential hazards. 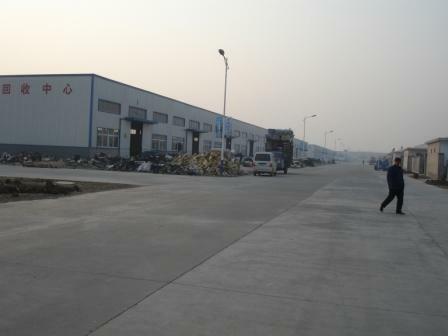 But none of this material is imported–it is generated within China, and in increasing volumes. 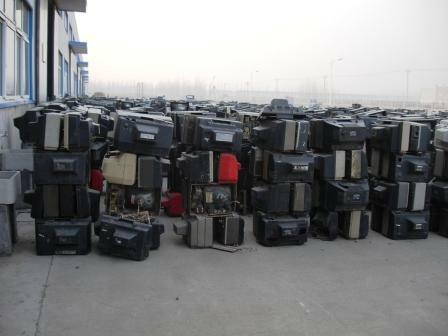 As I scan the landscape, I pause at the sight of a veritable field of old televisions that extends from a dock bay; it might be the largest inventory of scrap televisions in all of China. 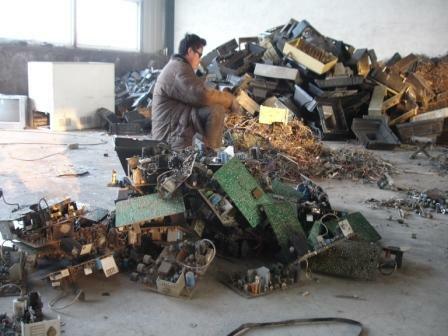 In fact, this factory dismantled 3 million individual pieces of electronic scrap–primarily televisions–in 2007 alone. 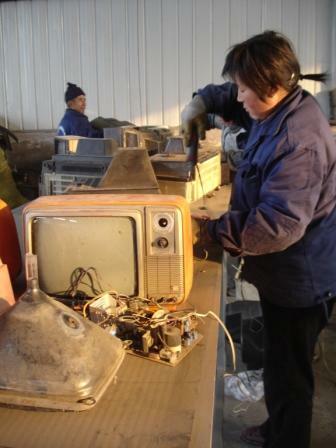 … In the warehouse closest to the gate at the Linyi China Electronic Recycling Center , workers are busy dismantling small black-and-white televisions on high tables surrounded by CRTs, piles of casings, and smaller pieces of electronics. To my left, two women are busy using electric screwdrivers to speed the process of removing orange plastics casings from televisions that look like they were taken from the set of The Brady Bunch. ï¿½Televisions last 20 years in China,ï¿½ explains one CRDC representative. ï¿½After the first owner, they are repaired and then bought by a poorer owner,ï¿½ thus it takes longer for them to reach their end of life than it might in the West or Japan. The women pay no attention to us as we talk about their work, concentrating instead on separating electronics from the CRT and wires from the electronics, sorting the various plastics, and then moving on to the next television. The best workers–all of whom receive a month of training–can disassemble more than 100 televisions in a day. … If there is one weakness in this system currently, it is the small profits the company can derive from recycling black-and-white televisions. The company typically makes, at most, 1 RMB (US$0.14) of profit from each television, CRDC representatives tell me, and that margin is shrinking because of direct competition. Today, a scrap black-and-white television can cost up to 43 RMB (US$5.93) to purchase on the open market – up significantly from 2003, when Mr. Liu first began to recycle e-waste, and the price was just 10 RMB (US$1.38). 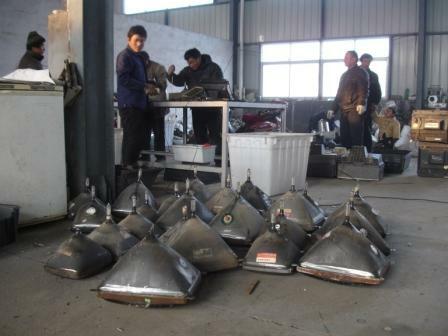 … Despite the progress in evidence at the Linyi facility, much more could be done there and elsewhere in China to improve the handling of electronic scrap, a CRDC representative tells me, ï¿½but we are learning quickly.ï¿½ As if to prove it, we again drive past Meibuï¿½s small dismantlers and pull up to the security gate of modern factory roughly 20 minutes away from the Linyi China Recycling Center. The sun has set, and the buildingï¿½s open bay doors cast a green glow on scrap televisions waiting to be recycled. Theyï¿½re stacked on a plot of land that, I am told, will soon hold a refrigerator dismantling plant. Inside the building, masked workers in hard hats work quietly in a row beneath sodium lights, disassembling televisions moving past them on a conveyor belt. Another worker is loading the televisions onto the belt from a dump hopper. The space is vast and clean. Workers quickly sort the disassembled parts into their proper bins and shove them off to the side. Workers wear uniforms, and they work with an intensity hidden behind shaded safety glasses. 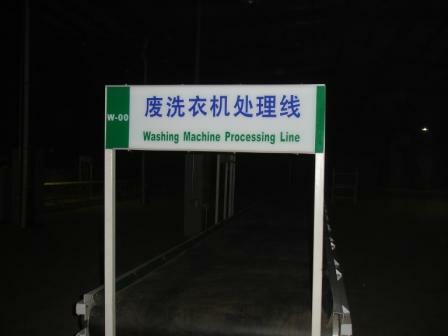 This plant, which is almost certainly the most advanced e-scrap disassembly line in all of China, is a 2007 partnership between CRDC and E&E Recycling, a cooperative of Taiwanï¿½s 12 major appliance manufacturers formed in response to the islandï¿½s development of strict electronics recycling standards in the late 1990s. CRDCï¿½s representatives assure me that the E&E process (partially developed in partnership with Adelmann, an environmental engineering firm based in Karlstadt, Germany) will set the benchmark for future Chinese e-scrap dismantling workshops. … Viewed through the prism of twenty years of industrial development, China’s e-waste and domestic recycling systems are receiving far more attention, from a much higher level, than the West and Japan did at a similar stage in their respective industrial developments. To be sure, the electronics recycling systems are far from perfect. There are still electrical components that the new facilities can’t use or process, many of which end up in the hand of the small-scale processors. But the same could have been said about CRT’s [television tubes], thin electrical wires, and stripped circuit boards before recent innovation and investment created these viable, profitable, more environmentally sound processing techniques. This entry was posted in Business and Trade, Environment, Scrap by Adam. Bookmark the permalink. Great post! We are a computer recycler in the US and can say that computer and electronics recycling is pretty big business, and yes most of the companies do not recycle the monitors because there either no margin or it is too risky because of environmental controls. Great article.